There is more to an office space than having a big desk and internet connection. There has to be comfort and more so for the person that spends a lot of time in the office. While you may tend to concentrate to make sure that you get the right furniture for your office, one of the things that you may tend to overlook is the chair. However, if you’re going to make your long hours in the office pleasurable without any back pains, then buying the right chair is definitely inevitable. However, the chair has to be able to also fit in with the environment and also serve its purpose visually as a part of the piece. That is where the WorkPro Commercial Mesh Back Executive Chair comes in. If you’re looking for a chair that is able to offer more than just comfort and improve your sitting stance, then the WorkPro Commercial Mesh Back Executive Chair does a great job. It is able to offer you the impeccable visual and cosmetic appearance that offers the work space an ideal and elegant look that only this chair can be able to offer. To be able to understand why this chair is slowly but sure becoming the unsung hero of the office space, it is ideal to look at a few of the features that it has to offer to paint the picture clearly. This is a feature that you will not find with a lot of other chairs. Considering that most of the people will have a sitting time of at least 8 hours, a chair that is easy on the back to let you even put in a few extra hours is the ideal partner and this particular fits that bill perfectly. Most chairs are made for people with a certain height and weight and even in some instance a certain sitting posture. 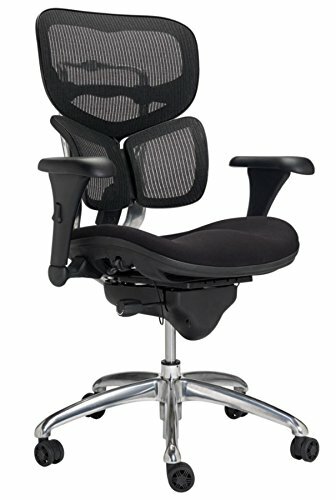 The WorkPro Commercial Mesh Back Executive Chair is a bit different and comes with a control mechanism that allows the user to adjust not only the height but also the tilt tension and the seat slider back to make the chair ideal for a variety of heights as well as a number of heights as well as people. The mesh back is not only ideal in enhancing circulation of blood but it also makes sure that at the end of the day, you don’t go home with a sweat stain on your back which can not only be embarrassing but utterly uncomfortable. Has a T-shaped bolt that makes tightening very easy. Offers great lumbar and back support. Has a sturdy build and is ideal for both office and home use. The lumbar support digging into the back though this can be rectified by adjust the chair to a more comfortable position. The arms are too wide for some of the customers. Seeing how functional the WorkPro Commercial Mesh Back Executive Chair is, there is no question that it will be able to make plenty of rounds on the industry more so considering that it has started off on the very proper footing. It could be enroot to making sure that a lot of office workers do not end up with back problems and can be able to finally put in the necessary extra hours.